Home > Archives > SDP40F locomotive No. 503, 1970s. SDP40F locomotive No. 503, 1970s. 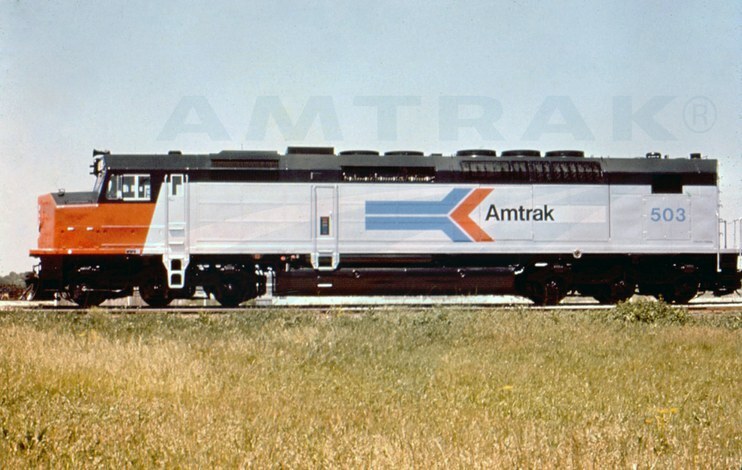 Color manufacturer's photograph showing a side view of SDP40F locomotive No. 503. Above is a manufacturer's photograph for SDP40F locomotive No. 503; it wears the Amtrak Phase I paint scheme introduced in 1972. The first locomotive built expressly for Amtrak, the SDP40F was a six axle diesel-electric unit that sported a 3,000 horsepower engine. It was manufactured in 1973 and 1974 by the General Motors Electro-Motive Division. Since many passenger rail cars were still heated via steam, the SDP40F included two steam generators and a water tank. Within a decade, most of these locomotives were replaced with F40PH models that could operate more easily with the new and refurbished fleet of all-electric passenger cars.